The general characteristics of several graft-induced changes in pepper were investigated in a cross experiment. 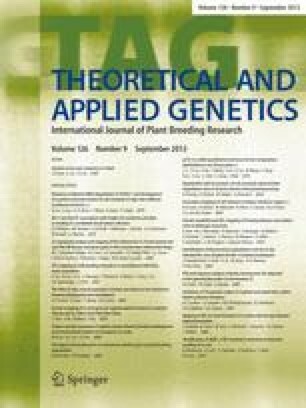 F1, F2, and BC1 progenies derived from crosses of the original stock and scion cultivars ‘Spanish Paprika’ and ‘Yatsubusa’, respectively, as well as their graft-induced variant strain G5S25 were analyzed for inheritance of the most conspicuous graft-induced variant traits. As part of a research program with the aim of revealing the mechanism of graft induction, the present study was carried out to examine the stability of the phenotypic changes and the characteristics of the graft-induced variants. For the fruit apex, a two-gene system was suggested, with other factors having a modifying influence. One of the two apex genes acted for pointed fruits and the other for inverted-blunt fruits. The inverted-blunt gene, the apex gene of the stock, was unambiguously present in the graft-induced variants, while the pointed gene that acted in the dominant mode in the original scion was inactive and expressed only under certain conditions in a mosaic state. The stable inverted-blunt cultivar used for the stock maintained certain factor(s) for pointed fruit, but the presence of that factor(s) could not be detected in graft-induced variants. The results of pungency analysis suggested a gene for non-pungency that appeared to be introduced in the graft-induced variants. The fruiting habit and fruiting direction that appeared in a mosaic state in graft-induced variants were found to combine factors of the stock with the appropriate characteristics of the scion asymmetrically. The bushy plant type appeared in a transgressive state in the variants, showing a definitely higher number of branches on the main stem and more frequent ramifications on the complete plant than on either the stock and scion cultivars or the progency derived from sexual crosses. A change in mature fruit color from red to yellow occurred in an early generation of graft-induced variants. Our results demonstrate that some of the characteristics of the stock were introduced into the progeny obtained from selfed seeds of the scion and that novel characteristics appeared as a result of graft induction.